A collection of writings about the science fiction and travel of Grand Master Jack Vance (1916-2013). The six essays were first published in "The New York Review of Science Fiction," while the one review was published in "Journal of the Fantastic in the Arts." 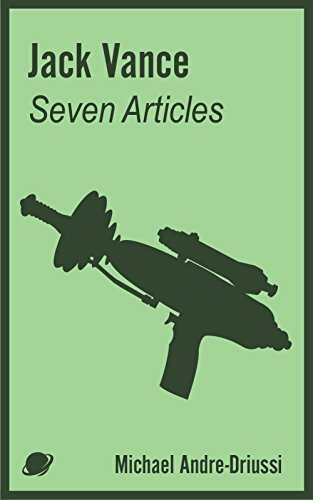 Topics include the curious linkages between some of Vance's novels into a sort of "Future History;" an examination of a Vancean "hard sf" novel; a look at his various globe-trotting excursions and what he wrote while out on each one; and further delvings into the methods he employed to create such memorable fiction. "Asi Achih: The Future History of Jack Vance"
"The Blue World: Jack Vance's Hard Science Wonder"
"The Adventures of Jack Vance in Traveling and Writing"
"Tracing Terms in Jack Vance's 'Sjambak'"
"Patterns to the Five Demon Princes of Jack Vance"
"'The New Prime' as Herald of Future Jack Vance"
Review of "An Encyclopedia of Jack Vance"